A fair introduction to an extended series. am in one of three groups Wizards of the Coast will reach with Duels of the Planeswalkers, a downloadable simulation of the prototypic collectible card game Magic: The Gathering. Players in the first group have likely heard of Magic but never sat down to try it. The second group's diligent investment has Wizards releasing new sets of cards every year — before removing select pieces as competition uncovers and exploits loopholes in the game's calculus. Those of us in the third group enjoy Magic and own a boxful of cards. My first chummy evening with editor Ed Kirchgessner was spent investigating Magic starter decks the two of us had purchased at the mall. Ed's unforgettable, two-hour match later that year was against contributor Rich Johnson. order, pace and look.But that was nearly fifteen years ago, and neither Ed nor I might have spent summer evenings playing Magic if it required more than switching on the Xbox 360. Basic yet not insubstantial, Duels of the Planeswalkers suffices for each group, and is a fair introduction to an extended series. Magic dramatizes the confrontation between two magicians — "planeswalkers" — who evoke power from the earth, casting spells and summoning armies of creatures, intent on banishing the other from the realm. Two players draw from personal decks of cards. One type of card (the land card), allows the playing of other cards (creatures, sorceries, artifacts, enchantments) that enhance or diminish or invalidate one another, all for the purpose of reducing an opponent's "life" score from 20 to zero. With arcane flair — slightly jumbled by aggressive background music and some irritating sound effects — Duels reproduces the game's order, pace and look. No need to look up rules or debate the interpretative legality of a card: duels proceed like clockwork, helpful clarifying messages appear the first time a cardinal event occurs, and so-called puzzles tutor players on finer points. If at the risk of pressing the wrong button, players are granted time enough to counter an opponent's move — while, for the opponent's sake, a timer ensures that a turn lasts no longer than is reasonable. Multiplayer options include two-, three- and four-player variants; though teaming up with a friend is presently impossible. 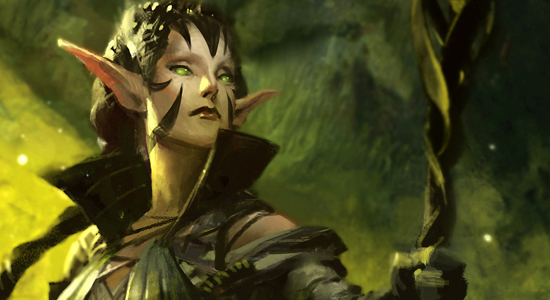 On the tabletop, deck-building is non-prescriptive, and is what seduces most. Players may choose from five colors representing the ensorcelled lands: white for plains, blue for islands, green for forest, red for mountains, black for swamp. Each color accommodates a characteristic style of play — white is decisive and enduring, blue is deceptive and adaptable, green is fecund and powerful, red is swift and damaging, black is resourceful and self-destructive — and, even in a simple deck, any color may be usefully included with corresponding land cards. Dozens and dozens of cards with distinct mechanics interact and repel, providing players with broad license on creativity or logical manipulation, and pleasantly unpredictable games. and hundreds of cards.Duels only partially obliges, here. In a campaign mode, players challenge AI opponents for access to eight sixty-card decks and up to seventeen optional, but effective, cards per deck. Five of the decks exemplify their respective single-color strengths with cards that are not only conservatively proportioned — forget the unorthodoxy of tournament collections — but more reminiscent of older, deliberate sets than of the lightning-fast, arithmetic promiscuity associated with Magic today. For those of you who understand: my first hand could have been from the 1994 Revised Edition. Some may appreciate this atavism; others won't. None of the decks can be altered, save for the addition or removal of unlocked cards. Additional cards can't be purchased. Complexity or cost aside, the interface's absence a) frustrates longtime players who enjoy organizing decks as much as playing them, b) limits replayability by narrowing possibilities, and c) shows new players an unrepresentative version of the game. As editor Jeremy Steeves remarks, he thinks he likes Magic — it's just that "over-simplicity and a lack of customization prevented me from truly experiencing it." And he only knows that there's more liberty with a deck in Magic than, say, pinochle because I told him. How many inquisitive gamers will bore of the title when they might have otherwise ordered a deck or two? It may not quite matter. Jeremy downloaded a free trial of Magic Online, a pay-per-card service that fastidiously includes every aspect missing here. Wizards of the Coast may be onto something.